Tournament Credentials: Various Gold, Silver, Bronze medals won in Japan, Europe and the United States. Personal Statement: It has been my honor to teach at US Taido Honbu full time for over 10 years. 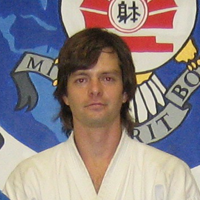 During that period, I have competed in virtually all forms of budo, including Taido Jissen, submission grappling, kickboxing, and mixed martial arts-in which I was the first Taido competitor. My experiences in the ring and on the tatami, fighting and teaching, have been a formative blessing in my life. I would like to thank all my teachers, students, friends, and family.